Ultrashort Light-pulse-induced vibrations of atoms in a lattice, called optical coherent phonons, have been controlled in various materials. However, different experiments demonstrating such control have been explained differently through empirical theories, and a unified theory based on quantum mechanics is lacking. Scientists at Tokyo Institute of Technology successfully formulated a unified theory for this phenomenon and experimentally verified it in diamond, the optical phonons of which have great potential for application in quantum information technology. When extremely short optical pulse enters a solid, the atoms in its lattice start vibrating. Collectively, such vibrations of atoms exhibit both wave-like and particle-like behavior, and in quantum mechanics, these vibrations are called coherent optical phonons because they are induced by light and oscillate in phase. Phonons can determine various physical properties of solids, such as thermal and electrical conductivities. In previous experiments, the properties of coherent optical phonons, such as amplitude and phase, have been successfully controlled in various materials through a technique called coherent control, which has been made possible by advances in ultrafast laser technology. However, the results of different coherent control experiments have been explained using different empirical theories. Therefore, a unified quantum mechanical theory that explains the control of optical phonons is required. Research team led by Professor Kazutaka G. Nakamura at Tokyo Institute of Technology (Tokyo Tech) collaborated with Professor Yutaka Shikano at Quantum Computing Center, Keio University and Institute for Quantum Studies, Chapman University recently formulated a theoretical framework that fundamentally and practically explains the generation and detection of coherent optical photons. The theory is based on a model involving two states of electrons as well as the quantum harmonic oscillator, one of the few quantummechanical systems for which an exact solution is known. Calculations based on this theory showed that the amplitude of a controlled phonon can be expressed by the sum of two sinusoidal functions. To test this theory, the scientists conducted an experiment of coherent control in diamond. Diamond is a very important material in this field because the coherent control of its optical phonons is promising to develop quantum memory In the experiment, coherent control is achieved by employing two extremely short laser pulses, known as pump pulses: one pulse induces an oscillation, or phonons, while the other controls the amplitude of oscillation. The time gap between the two pulses is varied to control the properties of the generated phonons. A probe pulse sent with a delay after the two pump pulses is used to measure the properties of the generated phonons by detecting changes in the transmitted intensity of this pulse with respect to the delay. 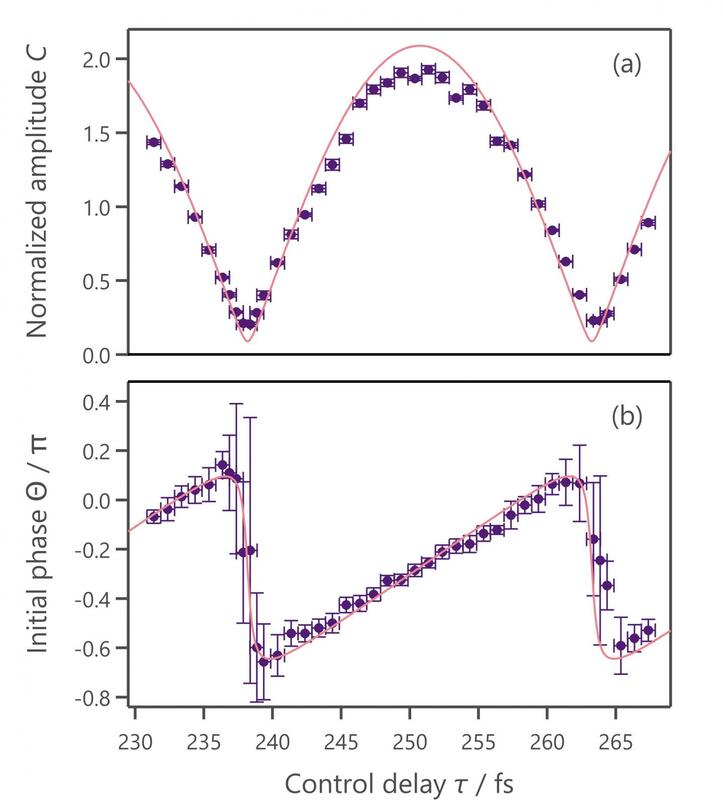 The measured amplitude and phase of controlled oscillations induced by the pump pulses in diamond showed a remarkable agreement with the predictions of the theory. Thus, a comprehensive understanding of the coherent control of coherent optical phonons has been achieved. This theory is expected to be useful in the development of memory systems for quantum computing, in addition to other applications in electronics, optics, materials science, and superconductivity.